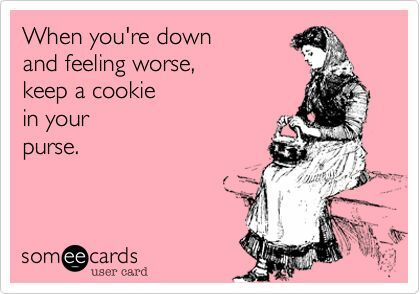 While a chocolate chip cookie would be the most satisfying, even made with dark chocolate it would be a slippery slope for me. I would want more cookies. I began to wonder if I could make a more healthy cookie – something that gives the satisfaction of eating a cookie with more protein and without the guilt. As soon as I got home, I headed right to the kitchen. Must. Have. Cookie. I started to play and ended up with flourless almond butter cookies. 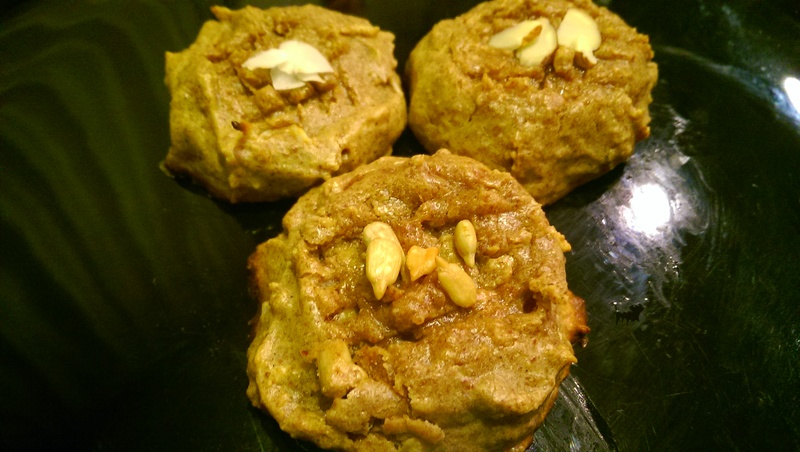 I made three varieties – almond, coconut and sunflower seeds. Similar to what I normally do for sweetness, I used pureed dates and vanilla. Honey or maple sugar would add more flavor than dates, but I try to stay away from them when a replacement can be used. While maple syrup and honey are better than refined sugar, whole dates have vitamins, nutrients and dietary fiber – it’s the dietary fiber that helps slow down the breakdown of the sugar, allowing the sugar to be released more slowly or gradually into the bloodstream (rather than the sudden rush and crash we often experience with sugars). I have seen packaged date sugar. I have not used it, but from what I understand, it is just dried ground up dates and is similar to whole dates (though sometimes properties are lost in the drying process, so I am not positive they are exactly the same). Because dates are tough and sticky, they should be soaked in water for at least an hour, but even better if they can be soaked for longer. Then blend them with a bit of water in a food processor to make a date puree – this can be stored for a week in the fridge. Add it to anything you want a bit of sweetness in. Vanilla is a technique food scientists use to trick your mind into thinking that something will be sweet. Vanilla is very low calorie, but strong in smell and flavor. Because it is often associated with sweet foods, your mind thinks the taste will be sweet. A single vanilla bean can go a long way and you can use paste, powder or extract for flavor as well. I never add any honey, maple syrup or artificial sweetner to my leafy green, fruit and protein smoothies – if I feel that the taste needs additional sweetness, I add vanilla. It does the trick. I read that the body does release insulin in response to sweet taste, even if the substance is not sweet causing the body to be hungry soon after…so what that means is that zero calorie sweeteners do not necessarily help in weight loss. I don’t know if vanilla has the same effect. Still vanilla is better than added glucose, fructose or artificial sweeteners. 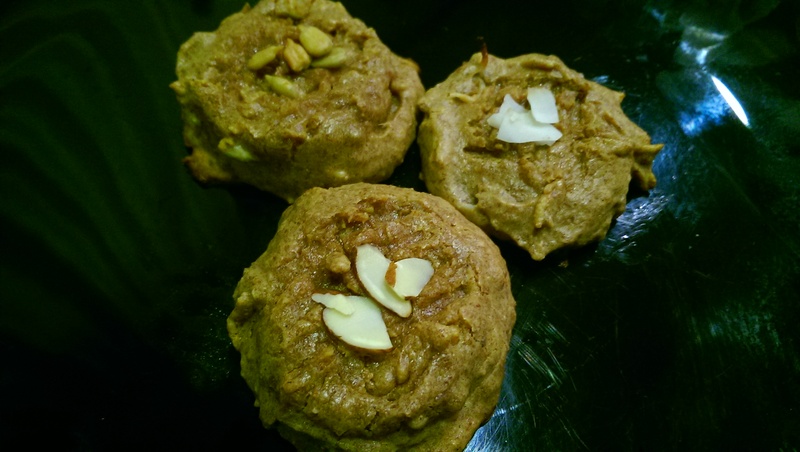 For the sake of variety in these cookies, I made a batch with slivered almonds on top, a batch with coconut for flavor and texture and a batch with sunflower seeds to add texture and even more protein to the cookie. Sunflower seeds have about 7 grams of protein in a quarter cup which is a lot for a little seed. Play with them – you could add chocolate, carob or salt crystals. If you don’t mind sugar, use maple syrup or honey as they add flavor. I think sunflower seed butter (sunbutter) would be a good option too. I think next time I might mix the seeds and coconut together. I used egg to bind the cookie together, but if you are vegan, feel free to replace with a flax substitute. Egg just helps lighten the batter and keeps the cookie together, so it is not as crummy as my day was. But between cookies as well as hugs and laughs with my family, my day ended on a very high note. 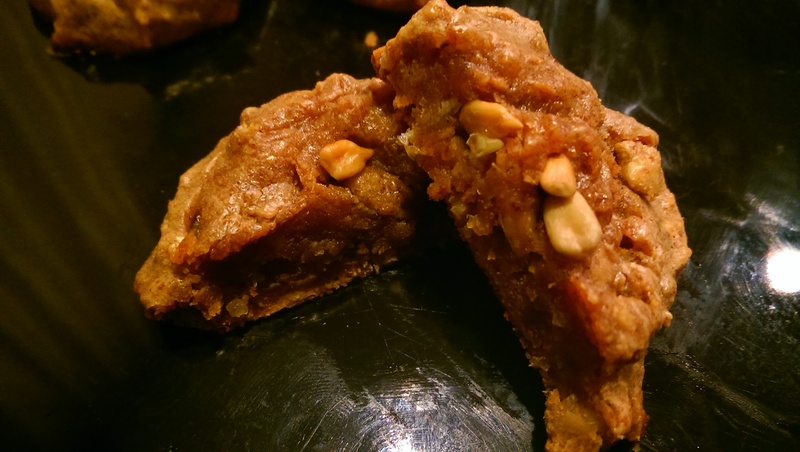 The cookies are cakey, not sweet and rich in almond butter flavor. Once completely cool, they have a brownie like bite in the center. The perfect little snack, especially when on the go. Heat the oven to 350 degrees F. Beat the egg, then add and mix together with remaining ingredients. Put a spoonful dollop of the batter onto a cookie sheet greased with coconut oil. Press a few shreds of coconut or sunflower seed or slivered almond for decoration. Bake for 10 minutes. Cool on a wire rack (at leas remove from the baking sheet so they don’t continue to cook). Sounds delicious… and travel ready, V! I’ve wondered how best to incorporate dates into baked items, so the soaking and paste-forming is a great tip!